Star Wars: The Last Jedi will be available on Blu-ray & 4K next week! Writer/Director Rian Johnson takes fans behind the scenes, revealing production secrets and never-before-seen footage and deleted scenes. 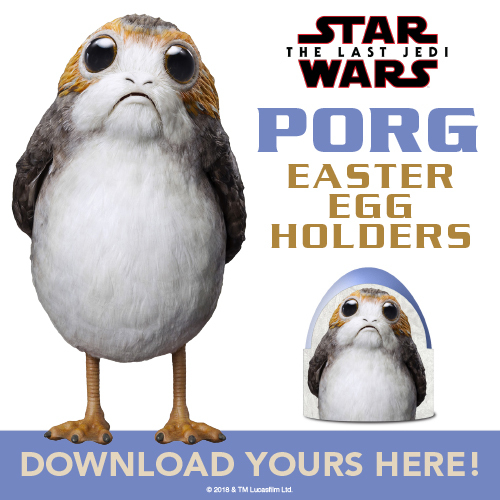 Get social with all the Star Wars fans using #TheLastJedi and be sure to share these Porg Easter Egg Holders with a Star Wars fan in your life! These are so adorbs! I am going to have to find something else to use them for once Easter is over! These are very cute. Thanks. How cute. I will have to show my boys. I know they will love to use them. Awww! These are so adorable! Those are so cute! Thanks for the printable!